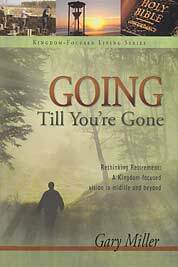 Going Till You're Gone encourages Christians to develop and maintain a kingdom-focused vision that will guide the latter years of their lives. It calls for a careful examination of the use of our resources. It appeals to older soldiers to encourage younger believers in the battle and to passionately help lead the charge. It helps readers imagine what is possible when a life is sold out for Christ. Most of all, Going Till You're Gone is a plea for godly examples-for older men and women who will demonstrate a Kingdom-focused vision all the way to the finish line.